I hope you all are sitting down for this one….a Pumpkin Pie White Hot Chocolate Recipe that’s Weight Watchers friendly?!?!? That’s right. And oh my word is it good. I got the idea for this while in line at Starbucks, drooling over their delicious fall drink menu. As soon as I got home, I put my daughter in her highchair and went to work whipping up this absolutely wonderful, low calorie hot chocolate recipe. My Pumpkin Pie White Hot Chocolate was so rich, creamy and decadent, and yet just a handful of Weight Watchers Points. The creamer and the vanilla sweeten the drink a lot, so there was no need to add any additional sweetener. Also, if you want to go even LOWER on the Points with this, just substitute the milk for Almond Breeze Unsweetened Vanilla Almond Milk. I tried it both ways and preferred it with the milk, but it was quite good with the Almond Breeze too. 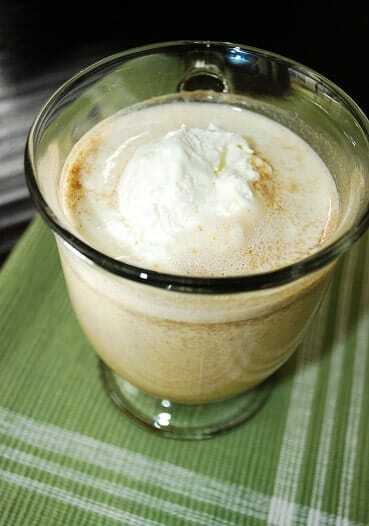 This is a perfect hot drink for a cold day…and it’s a great idea to have in place of a dessert! Seriously people, it’s that good. Make it….NOW! Treat yourself to this decadent fall or winter treat and enjoy the flavors of the season with zero guilt. Creamy, sweet and delicious, this pumpkin pie white hot chocolate recipe is just as good as a dessert. Puree all ingredients in a blender until well combined. Pour into a small saucepan and heat on low until the desired temperature is reached. Top with a dollop of fat free cool whip or whipped cream (optional). Do you think fat free half and half would be an ok substitute for the creamer? Yes, you just won;t get that white chocolate flavor. And you may have to add in a Splenda to sweeten it up if needed. I plugged in the ingredients in “recipe builder” on weight watchers e-tools and the point+ value comes up as 5 points…you may need to re-calculate. That’s the problem with the Weight Watchers Recipe Builder. It calculates the Points + value using the AVERAGES of nutritional data for the ingredients. Each time I make a recipe, I calculate it based on the specific and exact ingredients I use, using the labels right off the packages of the ingredients. In my experience, I have found the Weight Watchers Recipe Builder extremely inaccurate. Based on the nutritional data of the ingredients that I used in this recipe, it is 3 Points +. it would be nice to have the ingredients and not just the instructions when i go to print the recipe. So wish the picture would display for this – I love to see your pictures as much as I love your recipes. I’m anxious to try this! What would be the point count using fat free half and half instead of milk?